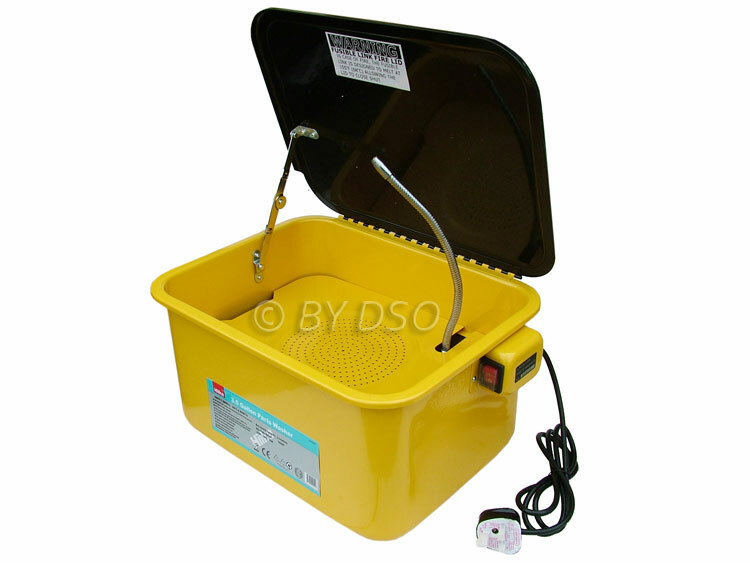 With a 3.5 Gallon capacity tank and a pump that can output 15 Litres per minute, this is the perfect place to wash contaminated or dirty car parts, motorbike parts, cycle parts and tools in your workshop or home garage. This model is for placing on the bench or wherever you see fit. It's compact size means it doesn't take up a lot of space and can be easily stored away when not in use. The flexible nozzle directs solvents over work pieces so you can either leave it running or agitate them with a brush. A major safety feature is the fusible link on the safety stay. In the event of a fire the link will melt and the lid will close automatically and extinguish the fire. So you can leave it running for long periods with peace of mind. The pump continuously pumps solvent through the nozzle at a rate of 15 Litres per minute.